In 10 short years, the entire baby boomer generation will reach retirement age. As this population exits the workforce, it will create a dynamic shift in company leadership. New leaders who step into boomers’ shoes will be designated as brand stewards and challenged with maintaining the culture, products and services that made these organizations so successful. A planned departure isn’t the only reason why company leaders change. Emergencies, illnesses, mergers and acquisitions, board dismissals, and resignations can all have a significant impact on businesses. PwC’s strategy and consulting business, Strategy&, reported in its 2016 CEO Success study that 14.2 percent of CEOs at the 2,500 largest public companies in the United States and Canada left their positions—but only about 60 percent had planned to depart from the organization. It was simply unnecessary to have a succession plan (47 percent). Even business owners or leaders who think they have a succession plan may have it confused with replacement planning. This typically identifies one or two current company leaders who are available to replace someone on short notice or during an emergency. The replacement is often a temporary, stop-gap measure and doesn’t account for a long-term, continual solution like succession planning. It is critical for companies to plan for unexpected and intentional exits by their leaders. By putting a strong succession plan and talent development program in place, companies can eliminate gaps in leadership, reduce costs associated with finding a replacement, and negate any bad press or lost confidence in the company. “The biggest thing a company can expect from implementing a well-thought out succession plan is confidence in the continuity of leadership,” Sexton adds. What exactly is a succession plan? For starters, it identifies the knowledge, skills and abilities needed by company leaders and establishes a plan to prepare individuals to perform these functions in the future. For a plan to be successful, considerations must be made for identifying skills gaps and training needs, retaining institutional knowledge, boosting morale and retention by investing in employees, and replacing unique or highly specialized competencies. Identifying top talent at different levels of the company and assessing key competencies like communication and team building are crucial components of a succession plan. As employees are considered for leadership positions, it’s important to understand how they inspire and persuade employees, how they communicate to generate buy-in, and if they can build a support team with different perspectives and experiences to generate discussion and avoid group think. Skills assessments like DiSC profiles help identify candidates’ strengths, where they have blind spots, and if they have the right makeup to be an executive or business owner. With a succession plan, there’s time to acknowledge, train and develop areas where future leaders need more work. Excluding successors from succession planning discussions and decisions. “Although succession planning needs to be initiated and monitored by top-management, it should include all members of staff,” she says. “Our philosophy is to ensure that everyone receives management-level training.” Not only can positions vacated by managers who leave be quickly filled, but they are often filled by internal candidates. Leadership is a learned skill that takes time and experience to build. 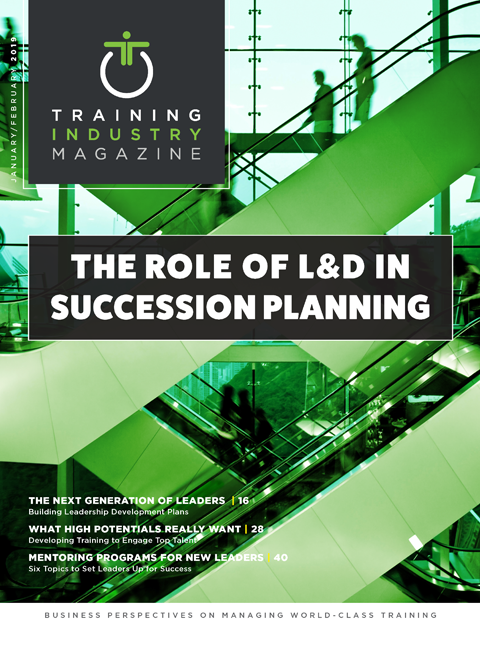 As companies plan for leaders to leave, they also must incorporate learning and development in their succession plans. Formal training programs designed to develop future leaders should be conceptual and experiential, customized to the needs of the learner, designed to help embrace and lead through change, and support the goals of a workforce. Companies like the Frank Recruitment Group offer job-specific skills training for their employees, as well as the opportunity to learn and experience leadership skills early in their careers. “Providing great training for the next generation is hugely important for us, and we know that it’s one of the things our employees really want to see,” says James Lloyd-Townsend, CEO of the IT recruiting firm. For example, all new sales and recruitment consultants spend the first month in an immersive training course that provides them with initial skills and tools they will need on the job. As they work, employees continue through the learning modules that are designed to develop confident leaders at every stage of their career. Resume Genius also provides a variety of training opportunities for its employees. Moric says each department head is responsible for hosting a monthly workshop focused on teaching a new job-specific hard skill or developing an existing one. To address soft skills, company-wide workshops are held each quarter to discuss general topics such as leadership, problem-solving, communication and teamwork. All employees are encouraged to pursue external training and development opportunities, and they are provided a budget and the time to do so. While business continuity is a major benefit of a succession plan, it also contributes to a positive impact on office culture and team confidence. “A clear and transparent succession plan gives a candidate clarity as to what is expected of them and what they need to achieve to take over a given role or position,” Esquire Group’s Sexton says. Additionally, it gives employees confidence in the stability of the company, and it provides for an objective way to measure a potential successor’s readiness to take over. By establishing a robust leadership succession plan, employees have a greater ability to move into leadership roles. Companies that develop their up-and-coming leaders benefit from improved retention of talented employees, reduced costs in external searches and faster decisions made to fill key positions, engaged employees who are encouraged by their career progress and new skills, and a positive corporate culture that encourages outside talent to seek employment with your company. Michele Markey is vice president of training operations for SkillPath, a professional learning and development company in Mission, Kansas.